I promised 'Friday' for this third, code-containing article, and according to my radio it's still Friday (Today in Parliament's playing) - so here we are. Before I even had a chance to fully document everything, this little time-travelling Roberts radio got spotted - first by the official Raspberry Pi news blog, then MediaUK, then by somebody else... Usually I'm more notable in the computer games world! Edit 2013-01-12: that 'somebody else'? Radio 4! Edit 2013-01-13: ... and now Hackaday! It seems Raspberry Pi radios are definitely a thing - I'm glad to join the club. 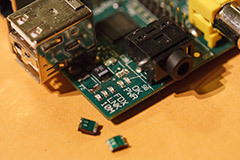 Firstly, a cheeky bait-and-switch with some entirely-not-software-related Raspberry Pi surgery, removing the pesky polyfuses which were messing with my WiFi. 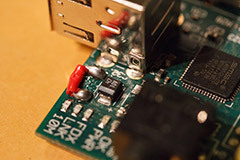 This procedure is to rectify a hardware problem that has long since been fixed on the Raspberry Pi - it is only necessary if you have an early Pi, wish to eradicate any remaining warranty and generally understand the implications of removing the current-limiting components from the USB subsystem. If you have any questions, don't. So here goes. Some surgical pliers (no idea as to the correct terminology) proved ideal for grasping each polyfuse lengthwise, leaving just enough space either end to poke the tip of a soldering iron against the end of the fuse. 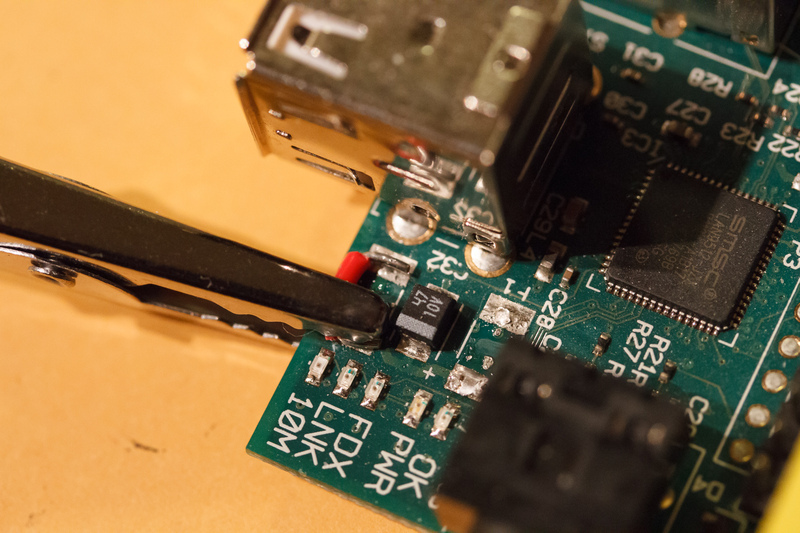 Apply a small amount of angular force through the pliers so that when the solder joint melts, the end of the fuse pops up slightly, away from the solder pad. 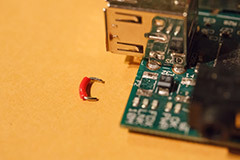 Otherwise, detaching both solder joints simultaneously is implausible. Once the polyfuses are gone, trim some bits of wire to cross the joins. I used 'C' shapes of vaguely thick single-core wire, with bits of insulation left in the middles. Clamping the wire by the side of the board in place with a crocodile-clip was really helpful - the inner one was much trickier. Quickly solder each contact in place, taking care to neither cook the board nor use too much solder - as mentioned earlier, if you have any concerns regarding this procedure, please don't do it. But still. Both my Pis (named gasbuggy and rulison, don't ask) made a rapid recovery and are now stable with Edimax EW-7811Un WiFi adapters. Yay! ... And after that diversion, now to the heart of the Radio-4-Matic - the dodgy scripting that metaphorically glues it all together. Implementation isn't exactly wonderful (I'm not much of a programmer), but these notes should hopefully help anyone wishing to improve on the concept, or is thinking of something else entirely. I kind of suspect there are UNIX utilities that would make something like this far easier, but I learned a lot while building this thing. The first bash-script prototype had get_iplayer (and thus rtmpdump) piping the live Radio 4 straight into a file, with mplayer being started on that file after a crude sleep 8h;. The FLV-wrapped AAC audio straight from rtmpdump proved an issue, with mplayer claiming an end-of-file after playing up until the size of the file as it originally saw it, even thought it had been much-extended since then. Attempts to encourage it to do otherwise were futile. Time to pipe that audio through ffmpeg, and wrap it in something more acceptable to mplayer's demands. Yes! It worked! For a bit. The capture side, get_iplayer and rtmpdump, had a tendency to cut out - presumably whenever a seagull over the Atlantic farted, or if a grizzly bear in the Midwest ran out of toilet paper. Something to do with the tubes being blocked? Only one way to improve this - stick the capture utilities in a loop, respawning them whenever they fell over. This would introduce gaps in the recorded audio, resulting in an ever-increasing discrepancy against 'actual' time - and rtmpdump demonstrated a new tantrum by occasionally getting stuck, but without exiting. Sigh. It turns out that the 'ffmpeg' packaged by Debian (and thus Raspbian) is actually libav, a forked version of the original project. Which helpfully provided an ffmpeg binary for 'backwards compatibility'. Edit 2013-01-12: Bob in the comments has compiled some more useful information on, erm, compiling ffmpeg. So, after baking in the Raspberry Pi's hypothetical code-oven for some time, out popped a piping hot ffmpeg binary. Which rode straight over non-monotonical packets without issues, squashing one of the potential causes of death. Next came de-spaghettification. A couple of cheesy helper functions for dealing with processes were born, all with pitifully little error-checking apart from where it mattered most. Recording and playback were separated into, um, separate functions, each as a simple switch() statement executing a single segment each time the loop was traversed, switching to other segments as necessary. It's almost readable now. But still in PHP. Mwuhahahaha! A super-modular, object-oriented, multiple-streams-possible Python rewrite is pending. Licensing: it's the good old MIT licence. In terms of open source, it's very open. More so than Linux. get_iplayer - the Radio-4-Matic is running version 2.82, but that or anything more recent should do. Someone's already written a decent guide to getting it running on a Raspberry Pi. rtmpdump - available in Raspbian's repositories. Imaginatively called rtmpdump. See installation instructions for get_iplayer above. ffmpeg - see pre-baked requirements above. 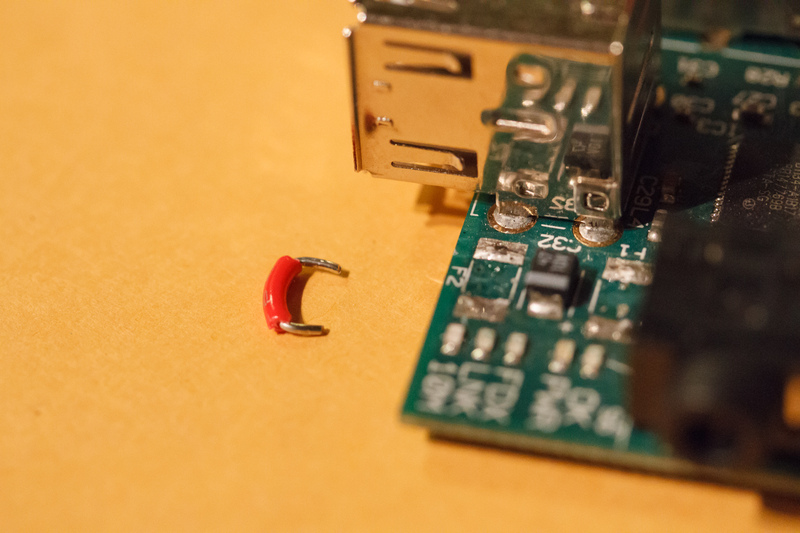 It'll work with the one from Raspbian, but it'll break. Monotonically. mplayer - installed by default? If not, install it! I've yet to add any particular automation to the current workings - I'm assuming you have SSH access enabled on your Pi, have working sound output and know some UNIX basics. Edit the radio.php to point at the appropriate binaries (I've put all the necessary parameters in, but you may want to tweak them or change the paths depending on where you have them installed), set your playback timezone and adjust the recording time ranges to your liking. Start up a screen session and start Radio-4-Matic with php radio.php. Ctrl-A, D to detach, screen -r to reattach to the screen session - this way you can leave the system running without needing an SSH session open. Depending on where you live, wait something like eight hours then and BBC Radio 4 should start playing - adjusted to your location, of course. Peer at what one particular subsection is doing with a tail -f <logfilename>.log. 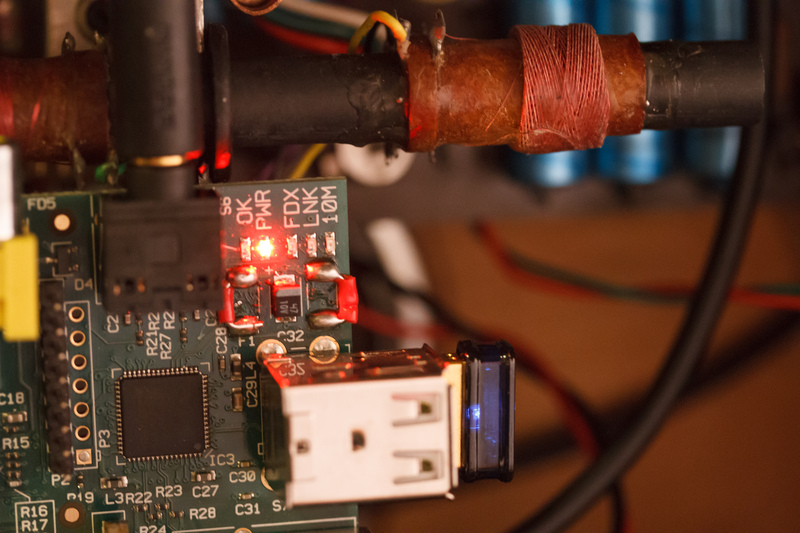 It'll probably run on a bigger desktop machine running Linux, or even Mac OS X or other UNIX systems, without modification - there's nothing Raspberry Pi-specific in there. Yet! If streaming has failed, then on playback you'll get a (correctly timed) gap in the audio until recording resumed. 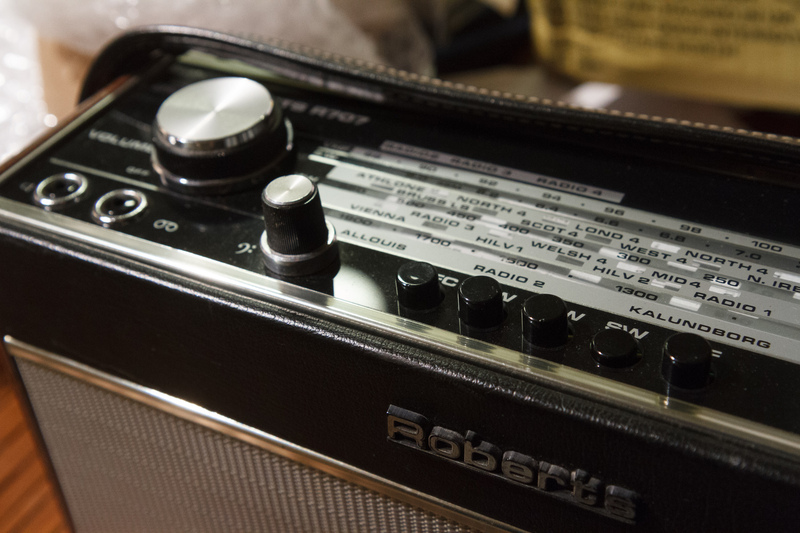 A future feature could be some authentic radio noise until the 'signal' is regained. Have fun - and if you happen to construct your own Radio-4-Matic, do let me know! There's lots of arcane magic in the way the various utilities are being invoked, so here's a rough explanation. There are surely many unnecessary parameters in here - stuff that persisted through different iterations - but this is how I've got Radio-4-Matic running fairly reliably. The please-use-only-for-good-not-evil get_iplayer is a monster of a Perl script, which parses stuff from BBC iPlayer to create parameters for starting a Flash-streaming program such as rtmpdump or flvstreamer. The words 'dreadful' and 'hack' come to mind, but it can be incredibly useful for tasks such as this. Explanation: start get_iplayer, in live radio mode streaming low-bandwidth AAC audio over flash, programme ID 'radio:bbc_radio_fourfm', streaming to stdout, reassure rtmpdump that no-really-this-is-live. Audio from the above gets piped through ffmpeg, a Swiss-army-chainsaw audio/video conversion tool. We don't want to change the underlying AAC-compressed audio, instead just repackage it from its mplayer-confusing FLV container into a much-more-standard ADTS container. Explanation: start ffmpeg, input format FLV, input from pipe 0 (stdin), disable video recording, copy compressed audio without transcoding or recompressing, output format ADTS, standards compliance level -2, send to stdout. At the required moment, the script starts mplayer on one of the recorded audio files and lets it play until it reaches the end. Explanation: start mplayer, disable video output (simply to suppress a warning message, disable file cache (forget any idea of the file being of fixed length, it could still be increasing in size), audio output device 'alsa' (suppresses another warning message). I'm not going to go into much amount of detail on this, given that it's (a) optional, (b) much more involved to set up given the remote server requirements and (c) it's more than a bit dodgy. But anyway. It's possible, and the script above supports it. I found that streaming became a fair bit more reliable, but still not perfect. You need tsocks and an SSH tunnel. So there. 1. Thank You For The Tutorial! Thank you for this excellent tutorial. This may come in very useful in helping me entice my family to come visit me in Maryland. They might stay longer if they can hear Radio 4? Even grandchildren? Also, the entire series helps me better see how to interface hardware ad software. This is an extremely good learning exercise for me. 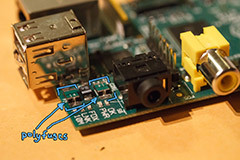 I tried the RasPi.tv instructions for compiling ffmpeg. There are some required dependencies that have to be installed for this. If you are using Raspbian Wheezy, getting the dependencies installed involves listing http://www.deb-multimedia.org/ in /etc/apt/sources.list -- you can find the details on their website. Then you must manually download and install the www.deb-multimedia.org keyring. Then you need to do an 'apt-get update.' None of these steps are obvious to new Debian users like me; I figured things out with help from RasPi.tv and Google. The screen program is very convenient for detatching from the terminal window without destroying the compile process running in it. I do nearly all my work with the Pi over an ssh login, so running 'screen bash' let me detach from the terminal that was running the compile, disconnect my ssh session, and do other things for a few hours. My attempt at the ffmpeg compile did indeed work. The only unusual things RasPi.tv advised was doing 'sudo configure' and 'sudo make'. I don't think that is necessary at all. The only time you need to do anything as root is when you want to run 'make install'. I've added a link in the article. Thanks! I compiled my ffmpeg from source directly on my Raspberry, and the compile seemed to complete successfully. (It took about 4 hours.) However when I ran `ffmpeg -v' to see if it will print a nice version string the way it did for you, I got a dismal 'illegal instruction' response. Clearly, something was broken. I checked the ffmpeg.org website and they suggest doing a 'make distclean' in the build directory prior to compiling. This seemed too simple, but I tried it. 4 hours later, the second (apparently successful) compile of ffmpeg also issued an 'illegal instruction' message when I ran 'ffmpeg -version'. Since I did have a faster machine that I can cross-compile on, I decided to give this a try. It took a while to set up everything but I was very encouraged when I was able to cross-compile ffmpeg successfully. I scp'd my install directory, which I called ~/rpi_bin, to the Raspberry, then ssh'd to the Raspberry, changed to the ~/rpi_bin directory, and then tried './ffmpeg -v'. This gave an error stating it could not load the libaacplus.so.2 library. I quickly added a *.conf file pointing to ~/rpi_bin/lib to /etc//ld.so.conf.d, ran `ldconfig', and tried `ffmpeg -v'. Bingo! Out spits a beautiful version string! I made many mistakes and did a lot of try, try, try again here. 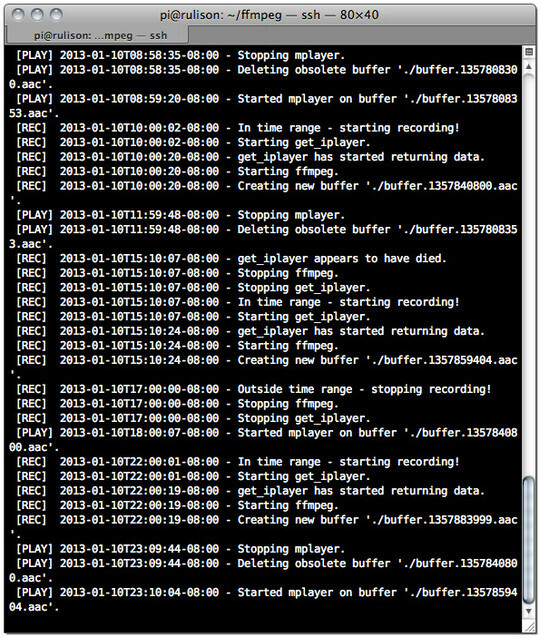 It took long hours to get ffmpeg to output a simple version string. That is the developer's story. Because the Raspberry Pi has very limited resources on board, it is probably well worth it to cross-compile for the Raspberry on another machine if you have a really ambitious project. I did essentially the same thing with my own stream for BBC Radio 1, though I had a perl script that took the output from get_iplayer and put it in a set of 8 hour-long buffers to do the offset from Seattle. A different script then would stream the feed over to icecast. The reason for doing it that way was to force it to resynchronize on the hour boundary. I'd be happy to share my scripts if there's any interest. The icecast thing sounds pretty cool. Do share! Apparently there's something on the Playstation 3 that'll do the same, but with television. Some friends here in Seattle watched the Russian New Year for the Seattle New Year that way - apparently it was quite surreal. I am moving to Zurich for work from the Gods Country (not Portland OR - Austin Texas). You have hit the nail on the head - if your shows arent on at the right time it almost makes the earth wobble on its axis. Did you ever get the info on the icecast solution? If you did could you share? I have a number of pi's laying around and this is perfect! !